In honor of the New Year, Boost Your Photography is spending the month of January featuring collections of top posts across a variety of topics. Today's post highlights top 5 posts about aperture. Previous top posts have covered camera settings, exposure, phone photography, DIY photography hacks, composition, lenses and accessories, top photography ideas, and macro photography. Aperture. 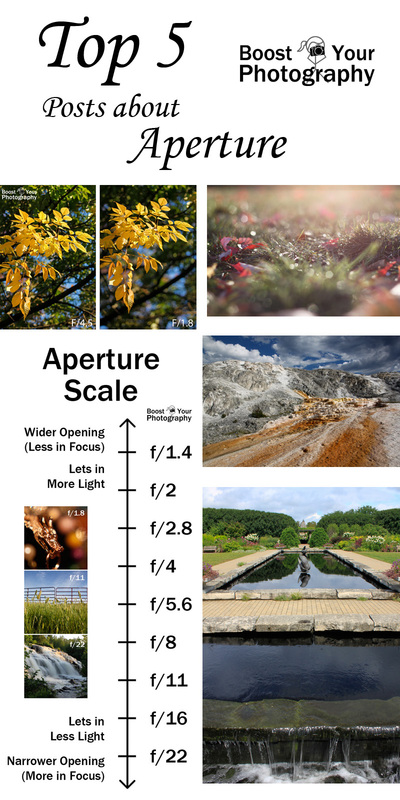 This top-ranked aperture post includes a useful visual graph that summarizes the entire range of the aperture spectrum, including changes in the amount of light recorded and how much of the photograph will be in focus. Aperture and the F/Stop Conundrum. Do f/stops confuse you? This introductory post on aperture clarifies the language of aperture and its connection to light and f/stops. The next three posts break this information down to focus on a specific segment of the aperture spectrum. What an Aperture of F/1.8 Can Do for You. Get a handle on aperture by focusing in on the wide end of the aperture spectrum. Find out the benefits of wide aperture and how to get those out-of-focus bokeh background shots. The Middle Range Apertures: f/8 to f/11. They may be known as the "who cares" apertures, but the middle range of the aperture spectrum has a lot of potential applications. What an Aperture of F/22 Can Do for You. The narrow end of the aperture spectrum provides a wide field of focus but requires a longer shutter speed or higher ISO. Find out how to balance those demands for that perfect shot.